Why waste your time on average, weak miners when you can have one of the strongest miners available? The Antminer DR5 is full of power and can be easily setup either by itself or in a large mining farm for massive crypto generation. As an ASIC miner, you’ll find that you get the highest speeds possible with Decred, one of the most unique cryptocurrencies you can find. Unlike others that give you no say in how the cryptocurrency changes and evolves through the years, Decred believes in a more democratic system where every user has a say in how the currency functions. Governance is one of their biggest priorities, ensuring that everyone has a say while profiting off mining the currency. If you want to get involved in this crypto, then the Antminer DR5 is your best bet. Decred is often compared to Bitcoin because it has many of the same benefits. The focus of Decred is very different, however, in that they value the opinion of the community. Bitcoin might be the most famous crypto available, but many experienced users have complained about the lack of direction and how only power users have any say within the community. Those at the top have been able to guide Bitcoin, but average users can’t do much of anything. Even if you buy a large array of hardware, there’s no way to reach the highest users at this point. While Bitcoin has done their best to correct this with hard forks and several derivative Bitcoin types, much of the community is still annoyed. Decred was built by Bitcoin enthusiasts and created for those who want their voices heard while they generate income and build their stake in the market. The whole community is polled when changes are expected, making this an inclusive crypto for everyone. You can either sit back and let things go as they are, or you can participate in the community. Aside from governance and decentralization, Decred separates itself by having two mining methods that you can participate in. You can do standard proof-of-work where you either go solo or participate in a group to mine the blockchain, or you can do proof-of-stake. This is where you buy a ticket for the block. After about 20 hours of mining, which results in 256 blocks, your ticket will gets added to the community library. About 99.5% of tickets get chosen before the four-month cutoff. You can then verify the block and get your ticket price back along with a stake bonus. Both ways are great and it all depends on your preference, but Decred is one of the few cryptos currently offering both options. Much like Bitcoin, Decred has a market cap of 21 million so that there isn’t an unlimited number of blocks and only power users can reap the rewards. All this happens in an effort to empower the entire community and keep things as fair as possible. Decred is expected to have good market longevity and it can be easily exchanged with other cryptos and turned into fiat currency. The Antminer DR5 is an exceptionally powerful ASIC miner built to work with the Blake256R14 crypto algorithm. This makes it perfect for mining Decred and getting as much crypto as possible. Each miner has a hash rate of 35 TH/s, or 35,000 GH/s. At low power, the hash rate drops to about 25 or 26 TH/s, which is still very fast. The wattage required is around 1610 W or about 1000 W at low power. This might seem like a lot when compared to some other miners, but you have to consider the speed. You’ll often find 2.2 TH/s miners at 900 W, so it’s easy to see that the energy increase is minimal compared against the speed increase. You’ll find that the Antminer DR5 is around 10kg in weight, so it’s fairly easy to move around and connect to your computer or network. You can easily use this on its own or create a whole network of miners. To keep things fair, much like Decred, we are limiting the number of sales to 10 miners per person. Whether you buy 1 or all 10, you’ll be sure to get a massive amount of hashing power. The miner comes with three boards and 216 hash chips. There is risk whenever you enter the crypto market due to fluctuating prices and interest increasing or decreasing in any cryptocurrency. Be sure to balance these factors before investing any money into a miner or any other hardware. We make no guarantee about the profitability of Decred or any other crypto, only that we make superb miners that can help you mine a massive amount of the currency. 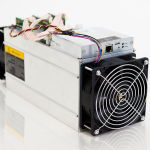 The miner is relatively easy to install and setup, especially if you’re an experienced miner. Whether it’s running solo or in a group, the DR5 shouldn’t take you too long to setup. Be sure to get a power cord, we only ship the miner itself without a power cable, so have that ready. If you want to enter the Decred arena or increase your share of this cryptocurrency, then our Antminer DR5 is the best way to do it. Not only does our miner have exceptional hashing power, but it has several other benefits as well. The power requirements are very low at only 1610 W, and the weight is only 10kg for easy setup. If Decred is your preferred crypto, then our DR5 miner will be sure to generate a massive amount of currency for you.